Glitter and Bonbons: IBS New Release - Happy Fall & A Spooky Halloween plus a Surprise! IBS New Release - Happy Fall & A Spooky Halloween plus a Surprise! Today we begin showcasing the new Inspired By Stamping stamp sets which will be available for purchase September 10. We begin with the stamp set A Spooky Halloween. I made a side-step card for this one using both the stamps and the (surprise!) digital papers that Joanna has begun creating. Aren't they perfectly suited to each other? She has created digi papers and printable pictures, some of which are featured here. I also used my Silhouette Cameo to cut the images you see here. Joanna is generous to offer FREE cut files with many of her stamp sets - less fussy cutting to be done! I put a bit of net-like fabric behind the letters and some jute twine around the bottom layers. An angled view showing the "steps." Next up is the set Happy Fall. I used some of the patterned leaf stamps on the background paper for some interest and cut the sentiment panel using three sizes of the Fancy Labels 2 Die. The little banners are from the new set Holiday Washi Tape which will be showcased on September 8. They are topped with vintage buttons. Some embossing and stitching add a bit of further interest. The inside has been stamped with our recently released Happy Sentiments set. Thank you for joining me, and I hope you will check out the other members of the Design Team to see how they have used these sets! These are gorgeous, Shea! Love the Halloween step card! These are fantastic, Shea! My grandchildren would particularly love the Halloween Side Step card. I'm pretty taken with it myself! 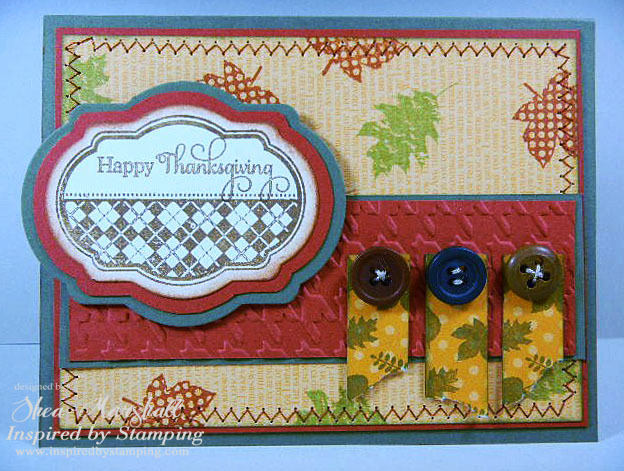 A terrific side-step Halloween Shea and such a colorful, country style Thanksgiving!! Gorgeous cards!! 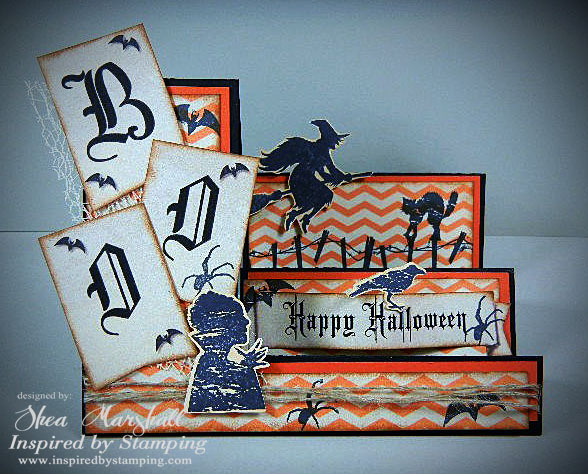 Your Halloween step card is fabulous!!! Love how you utilized it to showcase most of the images on the set!!! 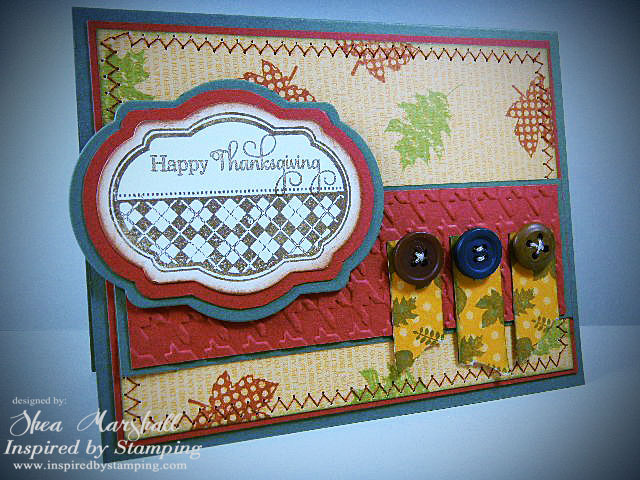 Gorgeous colors on your Fall card. Gorgeous layering and texture too. Fab step card! I think it looks like a piece of home decor that would fit right in to my own Halloween decorations. 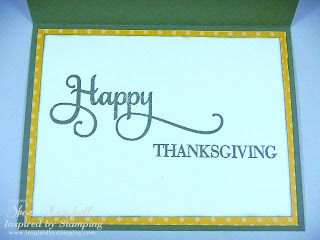 Love the leafy stamping on your second card too. I just adore those little leaves, and use them on my upcoming WHW tutorial. Great cards, Shea! And that stepper one is really impressive!!! Great side step card! Love the colors on the fall one!